Merging binary neutron stars are among the most promising sources of gravitational waves (GWs) for the next generation of interferometric detectors. Such waves carry valuable information about the masses, radii, and deformability of the two stars. Even a single detection would set stringent constraints on the equation of state of nuclear matter, which is still poorly known. Gravitational-wave observations, in combination with electromagnetic/neutrino counterparts, would also help to unravel the mystery behind gamma-ray bursts. Extracting this information from the weak gravitational-wave signal, however, requires an accurate a-priori knowledge of the waveforms, whose calculation in the final part of the inspiral can only be achieved via fully-nonlinear numerical calculations. This is particularly difficult to do, since even state-of-the-art codes employ methods to solve the equations of general-relativistic hydrodynamics that are second-order at best. As a consequence, obtaining reliable waveforms is prohibitively expensive and limited to a very small portion of the parameter space. Our work has shown that it is now possible to go beyond this limitation and obtain highly accurate waveforms when employinghigher-order methods. In particular, we adapted a class of high-resolution shock-capturing finite-differencing methods, that, in contrast to traditional finite-volumes methods, allow for an accurate coupling of the hydrodynamic and Einstein equations. 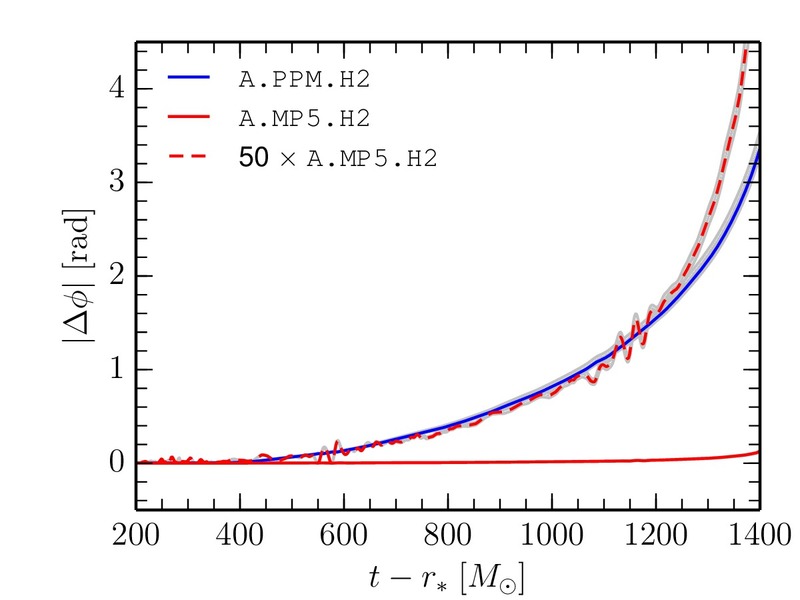 The paper provides a detailed explanation of how we overcame the difficulties that normally plague state-of-the-art codes, namely: the treatment of the stellar surface, and the very large density gradients developing during the collapse to black hole. Using the new methods, we could achieve higher accuracy at a lower resolution, and hence at a fraction of the cost, of traditional schemes. As an example, we have compared the results of the new code, WhiskyTHC, with those obtained with the widely used Whisky code. At moderate resolutions and for a particularly challenging neutron-star binary, the new code achieved an improvement of a factor ~50 in the accuracy of the gravitational-wave phase, which is the most important output of these simulations. Given the degree of success of these methods, we expect them to be used also by other numerical-relativity codes and to become essential to calibrate semi-analytic approaches. Estimated numerical error in the phase of the gravitational-wave signal computed using standard second-order methods (i.e. with the Whisky code), blue line (A.PPM.H2), and using the newer higher-order methods (i.e. with the WhiskyTHC code), red line (A.MP5.H2), at a common resolution. The dashed red line is the same as the solid-red line, but multiplied by a factor 50. This entry was posted in Author Insights, IOPselect and tagged code, numerical relativity, relativistic astrophysics by Adam Day. Bookmark the permalink.